The combination of chewy rice paper wrappers and fresh, crisp vegetables come together for a colorful healthy snack, appetizer or light meal. Add exotic flavor to this beautiful dish with a Thai-inspired dipping sauce that features The Olive Scene's flavor of the month, Lemongrass Mint White Balsamic Vinegar. 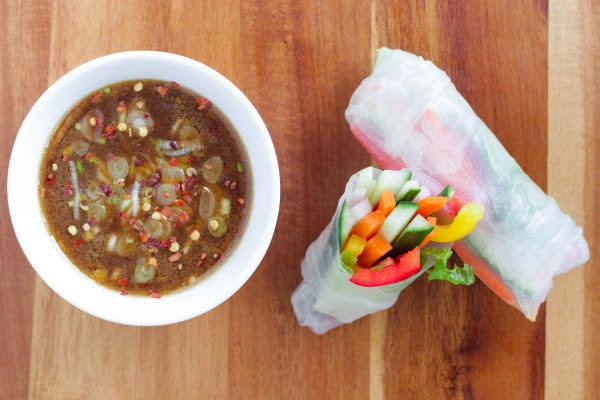 Rice paper wrappers aren't in everyone's pantry, but they're easier to find and use than you might think! You can find dried rice paper wrappers in the Asian section of most major grocery stores, and we've seen them at Cost Plus World Market. The package usually has instructions on how to prepare them, or you can follow our guidelines below. For a heartier meal, add your favorite protein to the wrap. Shrimp, shredded chicken, chopped steak, grilled fish or firm tofu are all amazing additions to this recipe. 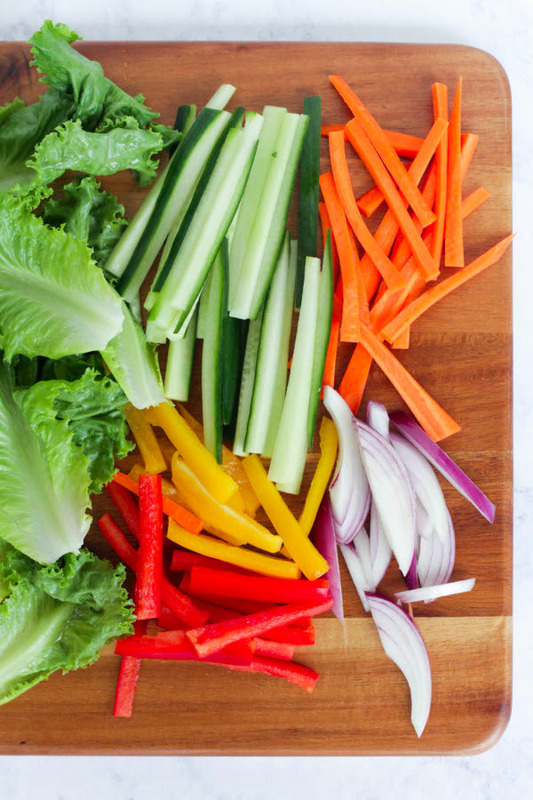 Assorted raw vegetables, cleaned and cut into long pieces. We love cucumbers, carrots, bell peppers and sweet red onions. Follow the instructions on the rice paper package to soften one dried wrapper at a time. If there are no instructions: find a baking dish or bowl big enough to submerge the rice paper wrappers. Place a few inches of hot water the dish. Working with one wrapper at a time, place the dried wrapper in the hot water for 5-15 seconds, until it becomes soft and pliable (don't over-soak, or they will get mushy and fall apart). Lay the wrapper flat on a work surface. Line up the vegetables in the middle of the wrapper, leaving a few inches on either end. Fold the bottom of the wrapper up to cover the vegetables and hold them snugly in place. Fold in each side of the wrapper, then continue to roll the bottom up to create an egg roll or small burrito-like shape. The wrapper will be tacky and stick to itself. Repeat steps 1-3 for the remaining wrappers. Make the dipping sauce by combining all of the liquid ingredients in a small mason jar or airtight jar. Shake to emulsify. To serve, pour the dipping sauce into a small bowl and top with the sliced green onion and pepper flakes (if using). Cut the spring rolls in half on an angle. Check out our recipe page for more ways to use our fresh and delicious products.